A Life of Sugar and Spice: These are a few of my favorite Casein-Free things! These are a few of my favorite Casein-Free things! All this talk about going casein free, but no product reviews?? Well here you go. The past two weeks have been great. I feel better every day and learn more about the casein free lifestyle too. People say "oh wouldn't that be great if you just had to cut out dairy!" (as opposed to gluten) but hey, guess what, casein is found in a LOT of products, just like gluten. I've spent so much time focused on going gluten free, now I have to read labels all over again. I am so thankful for the companies that clearly list allergens, we've come a long way baby! Casein still hides under many pseudonyms so I must be careful, but I'll get into that are in another post. First and foremost, this first product I use every day. Earth Balance natural buttery spread. It's an excellent butter substitute. This one does contain soy but they've come out with a new version that is also soy free which I intend to switch to. I don't mind a little bit of soy but since I use this so often, I'm going to opt for the non-soy version. Unfortunately the only place that I think they stock it is Whole Foods, and I don't get there very often. I spread it on toast, I use it to cook with, it's great! Then we have the two milk alternatives I've used. I buy these handy little 8oz juice box style cartons of Rice Dream rice milk because I really only use this for cooking/baking and if I opened a big carton of it, it would most likely go to waste. These 8oz containers are perfect. I grew up loving cows milk. When I was told to go dairy free 2 years ago to see if I was lactose intolerant, I ended up switching to Lactaid, which is cows milk without the lactose. I can't stand the taste of soy milk or any other milk alternative, so I just go without now. Maybe someday I'll find something I can deal with. 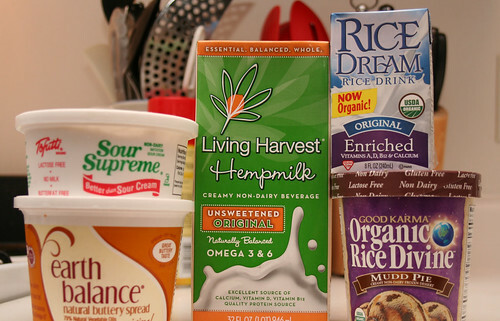 Which brings me to the Living Harvest Hemp Milk. I have not tried this yet but have heard great things about it so I'll let you know how that turns out later! And last but not least, is my sour cream substitute, Tofutti Sour Supreme. I just bought this the other day because I planned on making fajitas and I like sour cream mixed with my salsa in my fajitas. I tried it tonight and it was delicious! I'm typically not a fan of sour cream unless it's mixed with salsa or onion soup mix and served with potato chips. I think this will be the perfect substitution. Well my stomach is not so good today. I don't know if casein is slipping in somewhere, or if it's the gluten that's bothering me. I really should be just cutting both out completely. I know this, you know this, we all know this. But I thought it would be best to cut out just the casein for a while to see the difference. I could most definitely tell the difference, still no rash!! But I am sure that the gluten has got to go too. Well it's been a nice time eating good bread again, I still have yet to drink a real beer though. I just can't bring myself to do it! I guess that's a good thing huh? I'm going to finish out this week just as is, I can't waste all that bread.. and see how it goes. And by the time I go grocery shopping this weekend I'll know what I should buy. So is casein what makes people allergic to dairy? Not lactose? Or is it both? It's so confusing! Still I'm thrilled this experiment is going so well for you!